With Summer slowly winding down to a close, we’re trying to squeeze out all the outdoor goodness that we can, particularly in terms of outings with the whole family. There is no better way for me to unwind after a day at work than to come home, jump in the car with the ladies and head to a park, beach, or other destination. I wanted to share a few photos from some recent outings. Wingaersheek Beach is a terrific beach up in Gloucester that is normally pretty pricey. But get there late enough in the day, and the ticket booths are closed, so you can go for free. Above, Esme and I pose for a photo on the beach. She loves riding on my shoulders! See more photos from Wingaersheek. Bradley Palmer State Park has a very nice wading pool and play area. It’s extremely popular with the kiddos on hot summer days, and the cost is $5 to park, if you’re lucky enough to get in before the lot fills up. 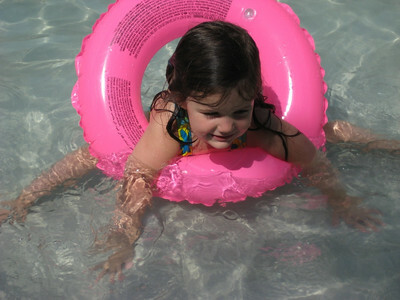 Kids can have a ball in the pool while mom and/or dad relax poolside, or join in the fun if they so desire. And there is a playground in the same space, so your little ones can go wild and run from the water directly to the playground and back. We took a picnic up there and had a blast in the pool. See more photos from the Bradley Palmer Wading Pool. Today we took a trip up to Manchester-by-the-Sea. Our intent was to visit Coolidge Reservation and the Ocean Lawn, but the 10-slot parking lot was filled up, so we turned around and went back to downtown Manchester where we had a picnic at Masconomo Park. 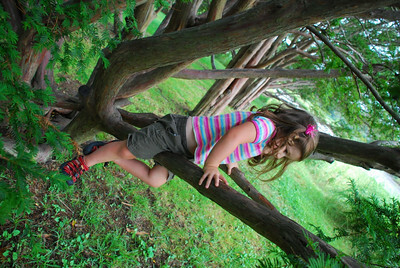 The park is situated right on the waterfront, and has a great grassy area, a nice playground, some really cool climbing trees, and views of the Manchester harbor. It’s also dangerously close to Captain Dusty’s, a local ice cream shop, to which we made a delicious trip. Try the “Groovy Smoothie” if you go there. It’s $4.99, but worth every penny for its deliciousness. See more photos from Masconomo Park. There are still a few weeks of summer left, so who knows what adventures we may still have? 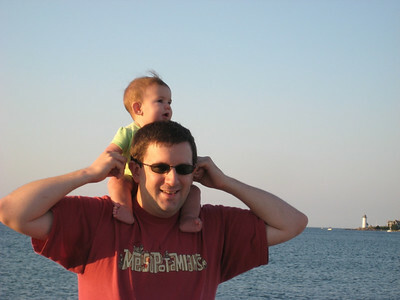 This entry was posted in Family, Life Near Boston on August 30, 2009 by Peter. Nikon SB-600: The Missing Link? But for me, the missing link in my photography kit was a good external flash unit. This weekend I finally had the opportunity to purchase one. I purchased a Nikon SB-600, Nikon’s middle-of-the-line flash. It currently sells for a little over $200 and sits in between the ~$450 SB-900 and the ~$100 SB-400. This flash provides a great deal more power than the flash built into my camera, can be rotated and angled to many degrees, and can even be positioned off the camera and remotely controlled. One of its greatest features is the ability to bounce the flash off of a wall or ceiling. This provides much more flattering light for portraits than a direct flash. On top of being a lot of fun and great for personal use, this flash will be a great asset for Peter R. Wood Photography and will allow me to offer more creative options to my clients. Head on over to photo.prwdot.org to check out my services and pricing. 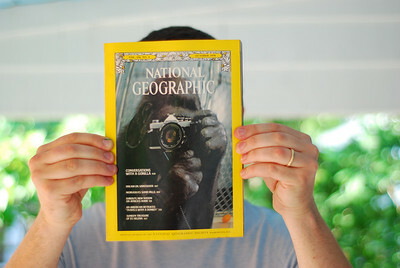 This entry was posted in Photography on August 9, 2009 by Peter. 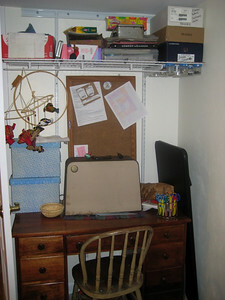 In our new and improved basement living room I have a whole corner devoted to my sewing equipment and such. There’s one large shelf on the wall and my Singer sits on a nice big desk. The desk has several big drawers. 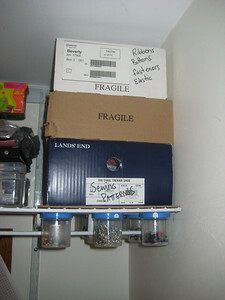 Between the shelf and the drawers I am able to store most of the things I need. What my storage hasn’t provided, however, is protection from exploring fingers. I love for Catherine to craft with me- and often let her play with the straight pins and pincushions or cut small bits of fabric- but I don’t really want her exploring those things alone. Last Sunday I fashioned up a little storage solution for things like pins (both straight and safety), buttons, clasps, bobbins and other bits and bobs. I started out with the hard back piece from and Ikea ‘Clips’ photo frame. It was chosen due to its thin nature and the fact that I already had it! The jars are just a few of the breastmilk storage jars I used when Catherine was in the hospital. I put in screws from above, through the board and then through the jar lid. 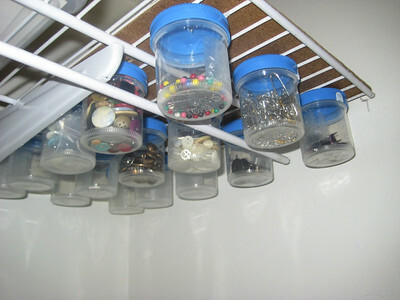 Then, I simply filled the jars and screwed them up into the lids. Viola! Storage that Catherine can’t break into…yet! 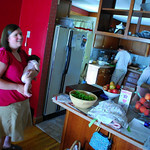 This entry was posted in Craftiness on August 5, 2009 by Rebecca. Esme is Five Months Old! Catherine is doing great as a big sister. She loves to hold Esme (supervised, of course) and is very attentive to Esme’s needs and moods. Esme has even worked her way into Catherine’s bedtime routine, which I usually handle. I will often give them a bath together (Catherine’s idea!) and will read them both stories. If I’m really on fire, I can even manage to get both of them to sleep (though not simultaneously). Oh, and there are more photos here! This entry was posted in Esme on August 5, 2009 by Peter. As of this week I am embarking on a year-long challenge. I’ve decided to train to ride the Sturbridge to Provencetown route of the Pan-Mass Challenge! All the details and such can be found at my new site Rebecca Rides: From 0 to PMC in One Year or Less. Come on over and check out the RSS feed! 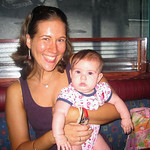 This entry was posted in Health and Fitness on August 4, 2009 by Rebecca. I love the Internet (and sites like this blog and Facebook) because it enables me to keep in close contact to friends and family that are spread out over the country and world. But there is nothing quite like seeing loved ones in person, so we cherished the time we spent with them this trip, even if for the shortest of times! Sorry for the shininess, Jenn! Despite the craziness of wedding preparations Jenn and I were able to squeeze in some time together. On Friday night she and I and Esme grabbed some dinner at the American Dreams Diner, or “the Shiny Diner” as it is known among the Bresnans. Amidst mirrors and loud decor we chatted and enjoyed some yummy breakfast burrito-type meals. 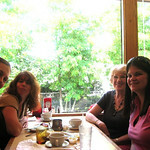 We also met up the next day with Jenn’s mom and other bridesmaids at the Westwood Diner. Yes, two diners in two days. The five of us had a great time gabbing and relaxing before heading off to get ready for the rehearsal and rehearsal dinner. 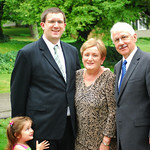 When we bid farewell to New York and New Jersey after the wedding we headed south to the City of Brotherly Love. While in Philadelphia we met up with Gordon pal, Amanda Thomson and her boyfriend Rich. The six of us had dinner at Pietro’s Pizza. The coal fired pizza was delicious and the conversation pleasant. Catherine even took a turn at serving some slices. Regrettably (and you’ll find this hard to believe) we have no photos from the evening. We’ll be sure to take some the next time we meet up! While we loved seeing so many Carters; Dave, Katie, Becky, Luke, Caleb, Sarah and Steve, we missed having Auntie Kirsten and Uncle Mark along for the fun. 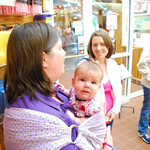 Heather and I and the babies visited the Friday morning Moms group at nearby Sprout Soup while the Dads and Catherine hung out at the playground. After lunch we headed home, sad to leave good friends behind. Catherine and Esme had a great time with Grandma and Grandpa Wood. They splashed in the backyard wading pool, swung on the swing set and had hours of fun playing playdough, Mr. Potato Head and Memory on the breezeway. We all enjoyed good meals together and Peter and I even got some time out- we had a nice date to Ruby Tuesday’s and saw Harry Potter. Heading towards home on Sunday we stopped in Mentor, OH to meet up with Melanie. Normally we swing through and visit her at work (and let Catherine run around the Children’s Library) but since she doesn’t work on Sunday we made other plans. The five of us enjoyed a lovely picnic lunch on the grounds of the Eleanor Garfield park right there in Mentor. 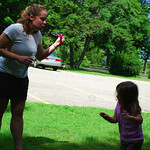 It was so nice to be joined in our picnic and to have someone new to blow bubbles with! It was also nice to have a traveling picnic somewhere other than at a rest stop on the highway! I truly wish that we didn’t have to leave anyone behind as we traveled back home. We are so blessed to have such wonderful friends and family; wherever they may reside! Thank you all so much for your hospitality, great conversation, games, laughs and love. Please darken our doorstep the next time you find yourselves in Massachusetts. 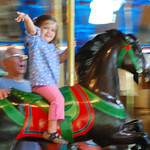 This entry was posted in Family, Friends on August 2, 2009 by Rebecca.